"The greatest UK digi there ever was.." - The mighty Unity, revive series on Honest Jons! 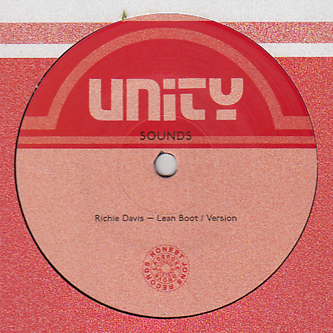 * Another chance to catch Richie Davis' 'Lean Boot'/Mikey Murka's 'Ride The Rhythm' on the slew of repressed Unity classics. Next to the drops from Selah Collins and Mikey Murka this ranks as some of the best UK digi ever released and we're absolutely powerless against its charms. This is the gear you hear Mark Ernestus laying down in Rhythm & Sound DJ sets and a huge influence on the Jahtari label or the 8-bit functions of the Hyperdub crew. Essential!